Premier debut of 4 extraordinary new offerings at the Cannes Festival, among them two flagships, Azimut Grande and Atlantis. 20 boats on the water and the debut of the Yachtique Concierge Club, a 5- star service reserved exclusively for Group customers. The Success of Azimut Grande and Benetti: megayacht sector spurs Group growth and garners international awards. Azimut-Benetti Group arrives at the first official event of the new boating year with 4 important new offerings, each one representing a specific market segment: the Azimut 40, Azimut 45, Atlantis 58, and the Azimut Grande 120SL. The four boats are the crown jewels of the large fleet on display at the Cannes International Boat & Yacht Show, with Azimut-Benetti combined exhibiting 20 different models. Expectations are high for the two flagships with Azimut Grande 120SL by far the largest boat built by Azimut to date and the Atlantis 58, while staying true to its sporty and punchy image, displaying a one of a kind versatility. The Azimut Grande 120SL is the first megayacht in the Azimut Grande series to be really Sport Luxury, truly capable of uniting sportiness with elegance and comfort: the result is clear. The continuity between the inside and outside generates uniquely luminous and refined spaces enjoying the yacht and the sea without limits also thanks to the power of the water jets which can deliver cruising speeds of between 36 and 40 knots. As the Atlantis 58, the sporty and care for ergonomics typical of the brand have in this new model their highest exaltation, making it the top of its class for dynamism and versatility. About performance, Atlantis 58 differs from competitors by being able to reach 38 knots and keep the sea very well, thanks to its new hull design. A pioneer through the changes that have radically transformed the international boating market scene in just a few years: today, the Azimut-Benetti group has a hand in everything, taking a leadership role in all the most promising markets in the industry. On this front, it is important to emphasize how quickly the Group has been able to redefine the scope of its business activities, and in turn, how this has altered the source of the Group’s sales. In pole position today is Brazil, followed by the United States (where the company continues to be the top importer), with the two countries accounting for over 50% total sales. The Group records also a continuous growth in the Middle and Far East markets, with a special focus on China. The strong focus on internationalisation has generated extremely gratifying results for all Group brands. This has been reflected in the increase in sales of Azimut Yachts in the United States, numerous international awards - including being ranked first place in China by the magazine, China Boating - as well as the firsts related to the brand’s green approach, investing significant resources to adopting technological and construction solutions aimed at reducing environmental impact. The revamping of the Atlantis series has been happily proceeding over the course of the year with 2 new models, the 58 and the 38; the latter is headed for a preview at the Genoa Boat Show. Particularly noteworthy are Benetti’s excellent accomplishments, delivering 14 yachts (10 Class and 4 Custom) over the course of the year and receiving orders for over 17 new boats. These numbers are the real proof of the boatyard’s manufacturing and organisational capacity, the high quality of Benetti offerings, and how successful it has been in completely revamping the series. In this regard, attention should be also drawn to the launch of the new series of custom yachts, the FB 800, a 50 metre fibreglass boat with aluminium superstructure. It represents an innovative combination that unites maximum design flexibility and space customisation with the substantial advantage of keeping the total weight below 500 tons. Further indications of the excitement circulating around the brand can also be found in the recent opening of a service in the United States. This has been launched to better track the post sales phase in the North American market which is in recovery in terms of the mega yacht sector. In addition, a direct sales and service office is opening in Hong Kong to be work with the Asian markets which have also been very receptive to mega yacht sector. Regarding the development of new models, it should be noted that once again the Group has met its objective to continually renew itself; because of this, it is ready for the autumn season with over 9 new boats. There are also new offerings in terms of service. The Group is working through Yachtique, a dedicated division that has chosen the Cannes Festival to present the world premier of the Yachtique Concierge Club. Unique in the boating world, the Club is exclusively reserved for Azimut-Benetti boat owners who can take advantage of the 5-star service 24 hours a day, 365 days a year. The service ranges from booking reservations for restaurants, cars, and private chefs, to up to the minute weather forecasts worldwide. It also takes care of buying and delivering groceries as well as offering a wide range of significant discounts related to fuel, boating services such as winter storage, motor inspections, and supplying a tender. Azimut-Benetti is the leading and most prestigious builder of mega yachts in the world. The Group, which includes the prestigious brands Azimut Yachts, Azimut Grande, Benetti and Atlantis, each addressing a distinct segment of the boating market, and Yachtique, the division exclusively dedicated to boat owner services, also headed by Fraser Yachts. The Group operates in 68 countries around the world through a sales network of 138 offices. The most eagerly anticipated gala dinner of the year - an event that ushers in the season’s most important new offerings - was held Saturday, 10 September, against the backdrop of beautiful Cannes: the awards ceremony for the 2011 World Yacht Trophies. The ceremony was organised by the publishing group LuxMediaGroup and presided over by a prestigious panel of experts, which over the summer examined the major new offerings for the season just now underway. At the ceremony, Magellano 50 by Azimut was crowned the winner of the "Best Innovative Design" category confirming that the direction taken by Azimut Yachts shipyards is indeed the right one. The specialist jury acknowledged the innovative capacity of Magellano 50, as well as its impressive technological content designed to serve the owner efficiently while safeguarding the environment. One of its main additional features is the new Easy Hybrid system, created by the Azimut-Benetti R&D department, which makes it possible to sail at speeds of up to 8 knots in complete silence using electric engines, switching to traditional propulsion methods with the greatest of ease. The exclusive "Dual Mode" hull, a new semi displacement design, makes switching from displacement systems to planing systems extremely easy, thus guaranteeing excellent stability and navigational comfort in addition to high hull reactivity and efficiency under all operating conditions. With Magellano 50, Azimut Yachts is offering not only a new model but also a new yachting dimension, once again asserting its great capacity for innovation as well as the design and manufacturing expertise which has placed the company at the forefront of the nautical industry throughout the world. The Atlantis 48 was launched at the Bank Of Valletta Malta Boatshow 2011 and was immediately declared the ’best in show’ by the organisers and 1400 people present for the event. The event and launch of the yacht was inaugurated in the presence of the Parliamentary Secretary Dr. Chris Said, Vice President of Azimut Yachts - Dott. Ugo Garassino, Bank Of Valletta Chairman Mr. Tonio Depasquale and Network Events Chairman Mr. John Formosa. Immediately distinctive with it’s metallic grey hull and gloss black hardtop together with striking orange upholstery the Atlantis 48 set the tone for the future of Atlantis Yachts in Malta. Dott. Ugo Garassino presented Azimut Benetti group’s financial strength, dimension and position as today’s market leader in the nautical sector together with its substantial investment is Research & Development and yacht marinas over the past years. He also reaffirmed the Group’s belief and prospect in Malta’s strategic geographical position with its intentions and ongoing discussions with the Maltese Government for the development of a yacht marina and refit facility in Malta. Network Events Chairman Mr. John Formosa also confirmed the intentions to expand and transform next year’s 6th edition of the Valletta Boatshow into an International Boatshow covering the Southern Mediterranean Region. Also on the night Ferrari and their regional dealer Cronos represented by their President Sig. Mario Schianina launched the new Ferrari FF accompanied by the Ferrari 458 Italia and a top line fashion show by local leading fashion boutique Rebelli displayed the latest ’prima linea’ Autumn/Winter Collections for 2011/2012. Azimut Benetti Group and their brands Azimut Yachts, Atlantis Yachts and Benetti Yachts are represented in Malta by Esprit Yachting. The Bénéteau Group recorded €921.5 million in sales over FY 2010-11, ended August 31st, 2011, up 18.3%. Thanks to this performance, following on from 18.2% growth in 2010, the Group is continuing to further strengthen its positions on its two business lines. For the boat business, sales came to €694.4 million, 21.1% higher than the previous year. With its sustained rate of product development (23 new models), the Group has continued to refresh and extend its ranges. In the four key areas from its development strategy (large power yachts, Asia region, powerboats in North America and South America), it achieved sales growth of over 70%, up to €67.5 million. The housing business generated €227.1 million in sales, up 10.4%. On leisure homes, the Group's sales climbed 7.5% to €208.4 million. This development has been driven by the confidence of outdoor accommodation professionals in their market and in the Group's brands. Residential housing (high-environmental performance and wooden-frame homes) recorded €18.7 million in sales, an increase of 57%. During its second year, it has continued to move forward with its development strategy on the housing market. Brunswick Corporation's dealer services team, through its Brunswick Dealer Advantage and the Brunswick Foundation, is proud to announce its continued support of college education for select children of its dealers' employees. Brunswick recently awarded scholarships to 28 sons and daughters of employees of its marine dealerships in the U.S. and Canada. Each recipient will receive $2,000 to assist with their tuition fees. The Brunswick Foundation Sons and Daughters Scholarship Program recognizes recipients for their academic excellence, leadership capabilities and civic involvement during the past school year. Recipients are chosen by an independent committee of academic professionals from leading Midwestern universities. Brunswick Dealer Advantage offers up to 31 leading dealer support services to Brunswick marine dealers in the U.S. and Canada. Brunswick Dealer Advantage services provide valuable tools that help dealers to build long-term profitability and value at multiple levels of their businesses . The services are designed to help dealers attract and retain employees, draw more retail customers, improve operations and lower costs. The Brunswick Sons and Daughters scholarship program is part of a continuously growing menu of leading marine dealer services from providers such as Brunswick Financial Services, BoatTrader.com, ARI (formerly Channel Blade), ADP Lightspeed and Constellation Dealership Software, AT&T and Sprint, GM, Aetna, AXA Equitable, UPS, Staples, US Bank and many more. Many programs offer rate advantages exclusive to Brunswick dealers. The number of programs a dealer can access increases based on the strength of the dealer's partnership with Brunswick. Opportunities for scholarships are offered to Gold- and Platinum-level dealers. In the last few days the new institutional press campaign of CRN, shipyard and brand of the Ferretti Group, specialized in the construction of completely customized steel and aluminium displacement mega yachts from 44 to 85 metres, has began. The communication agency Unbranded, managed by Lorenzo Cascino, has followed CRN since 2007 and it has designed and realized the fourth new institutional subject, planned to appear on the main national and international publications for a year. Italian design and its good reputation worldwide are the cornerstones of the campaign. In fact, CRN goes beyond an established and reliable shipyard and a luxurious and exclusive mega yacht. It is the key concept of “living”: the craftsmanship that represents the Made in Italy, a characteristic of the CRN yachts, is a universe of style, comfort and technology created for those who love the sea and who would like live it as a unique and exclusive experience that renews itself day after day. The campaign is branded “Born in Italy. Lived worldwide.” The campaign is branded by the copywriter, Jordi Apollonia, and the art directors, Manuela Valtolina and Silvia Volpe, under the creative management of Lorenzo Cascino. The CRN leisure boats have always represented prestige and exclusivity. Professionalism, advanced technology, versatility and flexibility, and sophisticated and prestigious design, have allowed CRN to put yachts at sea worldwide. At the moment the CRN shipyard of Ancona has 16 yachts under construction simultaneously, from 33 metres to 80 metres, 7 of which are leisure boats branded CRN (six made of steel: CRN 125 58mt, CRN 129 80mt, CRN 130 60mt, CRN 131 74mt, CRN 132 73mt and CRN 133 60mt, and a fibreglass Navetta 43#08 43mt and 9 boats branded Custom Line (three Navetta 33 Crescendo, two Custom Line 112 and four Custom Line 124 made of fibreglass), reflecting the continuous growth of the ever evolving CRN shipyard. Cruisers Yachts, Wisconsin’s premier manufacturer of luxury yachts, dealer meeting was held on Sept. 12 and 13 at the company’s headquarters in Oconto, Wis. The annual gathering featured Cruisers Yachts christening of the 2012 41 Cantius sports coupe, unveiling of a new interactive website and plans for the upcoming year. Building on the momentum created by last year’s breakout 48 Cantius model, Cruisers Yachts introduced the 41 Cantius. The sporty 41 Cantius showcases a first for Cruisers Yachts: a swim platform entertaining area with two removable bar stools, along with other quality features such as double salons, a full enclosure tri-slide glass door, two staterooms and heads, Volvo Penta IPS propulsion and customizable options. During the dealer meeting which took place in the factory showroom that was unveiled last year, Cruisers Yachts also introduced a completely redesigned website. Moving from a Flash-developed web core to a dynamic content-based system, the website is easier to navigate, allows users to explore models, provides up-to-date information on boat shows, news and brand messaging and has social networking capabilities. Key features include large-format photographs, featured content area on the home page, mega menus and a suggestive search. Crate Marine was the recipient of this years’ coveted Dealer of the Year Award. Crate Marine has five locations throughout Ontario and Quebec. They provide full marine sales and service and have been in the Cruiser Yachts family for three years. More than 100 dealers and guests attended the annual meeting, with dealers from six different countries represented. Featuring her latest hull colour option, the Fairline 58 Targa Gran Turismo express cruiser has arrived in Cannes following a six week western Mediterranean tour, in time for the opening day of the Cannes International Boat & Yacht Show. The model is the first 58 Targa Gran Turismo to feature a silver hull. The tour included visits to Spanish mainland, the islands of Ibiza, Mallorca, Menorca, the south coast of France and north western Italy. Better Capital today has announced that its Operating Partner, Peter Williamson has been named Interim Chief Executive Officer of Fairline. The remainder of The Board positions are unchanged. Peter has significant international experience having been based in the US, India and Germany and has successfully managed complex businesses for private equity since 1999. Three-fold success for the Ferretti Group, a world leader in the design, construction, and sale of luxury motor yachts with a unique portfolio of some of the most prestigious and exclusive brands in the nautical world, which closed the 34th Festival International del la Plaisance by winning three prestigious World Yachts Trophies with its yachts Ferretti 720, Pershing 108, and Ferretti Custom Line 100. In particular, Ferretti 720 won the Best Layout award in the category of Flying Bridge yachts below 24 metres; Pershing 108’ was awarded the Best Design prize among Sport Yachts above 24 metres; and Ferretti Custom Line 100’ was the winner of the Best Layout award in the ‘Flying Bridge yachts above 24 metres’ category. Organised by the French network Luxmedia Group, the World Yachts Trophies are considered among the most prestigious awards in the boating sector, since yachts are selected and evaluated by a highly qualified jury of experts, composed of the network’s Board of Directors. This year, for the first time, Genoa Boat Show visitors will also have the opportunity to trial some distinct boats of the Ferretti Group. The stretch of sea adjacent to quay G will be designated as a dedicated ‘sea trial area’ where clients will be able to experience the excellence and quality of the Group’s crafts first hand. The Ferretti Group, a world leader in the design, construction, and sale of luxury motor yachts with a unique portfolio of the most prestigious and exclusive brands in the boating industry worldwide, is participating in the 51st Genoa International Boat Show with an impressive fleet of 22 boats, including 1 world preview and 5 Italian previews. From the 1st to the 9th of October 2011, the 'Piazzale Marina 1 scoperto' area of the Genoa fair and exhibition centre the Group will present its Itama 62 (a world preview) and the Italian previews Ferretti 720, Pershing 74’, Riva Iseo, Rivarama Super and Itama 45. Many other ‘pearls’ representing the Ferretti Yachts, Pershing, Riva, Itama, Mochi Craft and Ferretti Custom Line brands will also be on display at the Boat Show, once again bearing witness to the Group’s incredibly wide range of boats, which are all distinct in their own right, but share one common denominator, which is a constant search for quality and innovation. Moreover, this year, the Ferretti Group’s customers and prospects will have the unique opportunity to visit and perform sea trials on some boats representing the Group’s prestigious brands in quay G. This new dedicated 'sea trial area' will provide guests with the opportunity to experience the excellence and quality of the Group’s crafts first-hand. With its prestigious fleet, the Ferretti Group confirms its commitment to the constant quest for style and functional innovation. The company has a unique ability to be a step ahead of the nautical market, foresee customers' needs and set market trends, in spite of the generally uncertain macro-economic scenario, and in a market which today is characterized by increasingly demanding customers. Formula is pleased to announce it has once again been recognized for excellence in customer satisfaction in NMMA’s 2011 Customer Satisfaction Index program in the catagories of: Inboard Express Cruiser Boats, Sterndrive Bowrider boats, Sterndrive Cuddy and Express Boats. The Marine Industry CSI Awards program honors participating manufacturers that actively measure customer satisfaction and pursue continuous improvement to better serve the customer. Award recipients have achieved and maintained an independently-measured standard of excellence of 90 percent or higher in customer satisfaction over the past year, based on information provided by customers purchasing a new boat or engine. Formula boats recently took a crew of 22 members to the beautiful island of Bimini in the Bahamas to photograph and video for the upcoming 2012 Model Year, and it was a complete success! Although the temperatures were scorching hot each day, it was hard to complain when looking at that gorgeous turquoise blue ocean and the sun glimmering off the Formula hull side. The boats photographed this year were the luxurious 45 Yacht with Sapphire Blue Metallic Imron Designer Graphic, the 40 Performance Cruiser in Black Onyx Metallic Imron, the 400 Super Sport in Black Onyx Metallic Imron, the 350 Sun Sport in Morning Sand Metallic Imron with Tropical Red accents and the all-new sporty 310 FX5 in Black Onyx Metallic Imron with FX accents throughout. 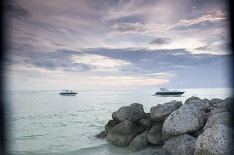 The boats performed and looked amazing each and every day on the gorgeous Bimini blue water. Grand Banks appreciate the support of all the fans, owners and enthusiasts who have liked us since Grand Banks Yachts launched its page on Facebook last year. This number is today at 1500. Grand Banks will continue to do more through Facebook: more new photos and video, fun stories and shared discussions with the Facebook community. Jarrett Bay Boatworks in Beaufort, North Carolina, has been presented with the 2011 Award of Excellence “Boatyard of the Year” designation from the American Boat Builders & Repairers Association (ABBRA) at the association’s Annual Conference, held in New Bedford, Massachusetts. Jarrett Bay Boatworks was one of six to receive a prestigious ABBRA award presented on an annual basis and designed to recognize individuals and companies from the boatbuilding and repairing industry for their excellence throughout the year. ABBRA’s “Boatyard of the Year” award is given to the service or repair facility yards. With Irene's landfall just a few miles from our Beaufort, NC headquarters, Jarrett Bay was very happy to report only very minor damage and a very smooth & successful of hurricane haul-out procedure. Here's a few quick facts about our Hurricane Irene preparations: Over 220 vessels rode out Irene on the hard at our Beaufort, NC facility, the service department hauled approximately 150 vessels in 4 days, multiple vessels of over 80 feet in length two over 100, 41 more vessels were hauled at our Brielle, NJ location. Power was restored to the Jarrett Bay Marine Park on Monday evening and we're now working just as vigorously to return boats to the water, as needed by their owners. With the 2011 tournament season approaching conclusion Jarrett Bay has some exciting series championships to tell you about! For the 2nd consecutive year, a Jarrett Bay boat has won the North Carolina Governor's Cup! Congratulations to the Alliance Fishing Team aboard the 58' Gypsy Angler and the Galot 3. The team totaled 3200 points this season with 772 point margin over 2nd place! Additionally, the 51 Jarrett Bay, Bill Collector came in 1st in the charter boat division! The Ravaganza fishing team won the Custom Shoot out Series with 4400 points. Congratulations to Capt. Dave Fields & the Wall Family on their impressive victory over 33 boats during the tournament. Moonen informs that its Communications Manager, Heleen van Hout, has decided to leave Moonen Shipyards as per October 1. Moonen would like to thank Heleen for the highly professional way she has carried out her work over the last five years and wish her all the best in her future career. Heleen will be succeeded by Dorien Bilterijst, a graduate in Marketing & Communications who joined Moonen Shipyards in 2008 as Marketing and Sales Assistant and also served as Online Media Manager for the last six months. This year Mulder Shipyard will again be participating in the HISWA Amsterdam in-water Boat Show, which takes place from 6 to 11 September. During the event we will present our Mulder Favorite 1500 for the first time to the Dutch public. Also on display at the show will be the Mulder 82 Flybridge, a yacht that recently underwent a refit and has been put up for sale by her owner. Overmarine Group, the Italian Maxi Open Yacht Builder, celebrates its first time at the Cannes Boat Show independently. Last year, Overmarine Group decided to totally change its approach to the market. After being represented by an exclusive dealer for many years, Overmarine Group directly markets its jewels: the Mangusta Yachts. Mangusta brand has always stood for excellence in luxury and peak performances, setting new standards in the marine industry, becoming widely recognized as the benchmark in design and manufacturing of fast Maxi-Open Super Sport Yachts combining speed and technology and more simple to operate. Overmarine Group was founded in 1985 by the Balducci Family and it is still today a family owned business. Based in Viareggio (Italy), the capital of the semi-custom built yachts, Overmarine offers a range of 7 Maxi-Open from 72’ to 165’. Additionally, a full-displacement ship the Mangusta 148’ Oceano - , and a project for a new Mega-Open yacht 205 Mangusta are under costruction and in planning stages respectively. Mangusta 165 is at present the biggest built Super Sport yacht in the world. Although for many years Overmarine Group has essentially been a boat builder committed to the development of the best quality available in the market, its future is now to get an active role in the direct promotion on the market of its range through a selected number of offices and partners in strategic areas. New strategic steps have been undertaken which include: A new communication strategy with a brand new advertising campaign, new communication tools including a new website have been created. Thanks to Overmarine’s established financial and economical stability as well as reliability, a new commercial strategy has been developed with a selection of four strategic partners : 1. Marine Max for United States, 2. La Mar Aqua for Turkey, 3. Burevestnik for Russia, and 4. Infinite Yachts for France. Having recently received new shareholding entrance Raffaelli heads into Genoa boat show with a renewed interest. Here the Italian, Adriatic sea based yacht builder will presents its range of products, and what today has become the new Raffaelli style. The boat builder wants also to present the new staff of the new Raffaelli yard. In Genoa Raffaelli will show to owners, friends, and passionate boaters the new innovative solutions, of design, colors, and engines. The third annual Ranger Tugs Owner’s Rendezvous event was held September 9-11 at the Port of Bremerton Marina in Washington. The annual event is organized by an active group of owners and supported by the factory. There were over 150 people in attendance including Ranger Tug owners and enthusiasts plus Cutwater owners and 68 total boats, more than 20 additional boats than the previous year’s event. The Owner’s Rendezvous is a growing event with guests who traveled from California and Michigan to Maine, New York and even Florida to attend. Ranger Tugs displayed all of their 2012 models, had live music, a barbeque, cocktail party and enough raffles and door prizes that almost everyone left with a prize. With each Ranger Tug model displayed, ranging in size from 21 to 29 feet, the rendezvous offered attendees not only an opportunity to compare the different models, but also an opportunity to participate in various social and educational events. She shared that over 60 items were collected for auction such as West Marine binoculars and three gift certificates for a two-night stay at the Roche Harbor marina. After it has successfully provided sunshade for the lucky owners of earlier Riva designs, such as, not least amongst others, Riva Rivale, Turin based Opac has delivered a new concept for latest Riva Iseo, launched Sarnico, Bergamo, just days ago. Based on the consulting of specialists at AYT’s Mechanical Propulsion Platform, a research and engineering division of Gruppo Ferretti, OPAC has taken on the complex challenge of a new Riva runabout. Major criticalities on a 27 feet design were minimized spaces to recess a fully automated soft top also based on the same mechanism as of sophisticated convertible cars. Opac’s retractable hood folds back into space created aft of the boat’s rear sofa, and remains concealed behind automatically activated ad hoc hatches. Leveraging on an experience of more than ten years in the automotive industry, and in collaboration with their client, OPAC has worked on convertible soft top option volumes to determine storage space between cockpit sofa and engine room to recess the mechanism, in a minimized design to host engines and cylinders, enabling the automation of both the soft top structure and the doors which, closed on the recess, conceal the system when not in use. Hatch seals are silicon insulated to ensure a totally watertight environment, as originally designed. This insulation resists speed of over 40 knots. Special care has been taken for practicality and safety. When in use, Opac hood’s rear window and forward segments are easy to open to ensure a quick way out, in the case of an emergency. The system also facilitates the mobility of passengers and their disembarkation when the boat is docked laterally or stern to. Opac’s hood front opening makes it easier to maneuver the craft to dock, at the same time that it consents passengers to remain standing during navigation for better visibility and airing. Passengers on the rear seat are afforded adequate visibility through transparent side windows. Parallel to this system, Opac has designed a bimini top to afford passengers to remain standing, albeit protected from the sun. Both designs are perfectly interchangeable and may be replaced at any time (pre/post sale) at your closest Opac or Riva technical assistance services. Aquariva the historical Riva model has reached the momentous target of 200 units - success lasting over a decade . Aquariva, the historical Riva 33 footer developed in the year 2000 by the designers at Officina Italiana Design, the exclusive designer of all the yachts in the Riva range, AYT – Advanced Yacht Technology – Ferretti Group’s naval research and design centre, and the team of architects and designers of Centro Stile Ferrettigroup, reached the prestigious goal of 200 units, a success that testifies the great value of Riva yachts. Designed as the heir of the legendary Aquarama, Aquariva has become a symbol of elegance and timeless style and is now one of the most famous, best loved yachts in the world. From her predecessor, she has inherited the success which continues nonstop, season after season. Over the past eleven years, Aquariva has established herself as an out and out classic of the nautical world, going far beyond fleeting fashion and becoming, thanks to the perfection of her details, a model adored by the international jet-set. The soft, elegant lines of her 33 feet carry the flavour of tradition, and the valuable woods used for the deck - mahogany inlaid in maple - are beautifully processed. The exclusive leather finishes of the elegant dashboard and helm enhance the pleasure of cruising, offering both excitement and unparalleled comfort. Over the years, Aquariva has become one of the most evocative images of Italian style, a first class symbol of craftsmanship and exclusive quality, but also of the Dolce Vita and all- Italian glamour. These are the reasons why Gucci approached the nautical world, and particularly Riva. On occasion of the 90th anniversary of the fashion house, in fact, Frida Giannini, Creative Director at Gucci, and Officina Italiana Design created a personalized model of Aquariva, the Aquariva Gucci. The project is a perfect balance between past and modernity and reflects the long tradition of design excellence and craftsmanship the two brands share. Last year, Aquariva entered the art world, too, with the reinterpretation of well-known Australian designer Marc Newson, who, in association with Officina Italiana Design, developed Aquariva by Marc Newson, launched as a limited edition of just 22 units and sold throughout the world by the Gagosian Gallery in New York. The Aquariva was the very first project produced after the shipyard was purchased by the Ferretti Group, and has celebrated the achievement of two important targets in just eleven years. In 2006, on occasion of the production of the 100th yacht, a limited edition called Aquariva Cento was created, just ten units, all of which were sold before they even entered production. Moreover, hull no. 100 was auctioned during a charity auction in London in favour of the Prince’s Trust, the charitable association founded by His Royal Highness the Prince of Wales to help disadvantaged young people in the United Kingdom. Aquariva 200 will be on display at 51st Genoa International Boat Show, from the 1st to the 9th October 2011. Riviera, Australia’s largest and most awarded pleasure boat builder has continued to expand its global dealer network with the appointment of Yachts Srl based in Milan and Sardinia, Italy. Riviera’s director of sales and marketing for Europe, Asia and the Middle East, David Taylor was proud to announce Yachts Srl as Riviera’s new exclusive dealer. Yachts Srl dealer principal Filippo Introzzi who has grown up in the boating industry and attended many boat shows is looking forward to the company’s debut at the Genoa Boat Show in October. Yachts Srl will make their debut at the Genoa Boat Show which runs from October 1 to 9 where they will showcase two of Riviera’s latest and strongest selling models, the 53 Enclosed Flybridge, which was launched in May 2011 and has already received 18 orders, and the 43 Open Flybridge, which was launched in May 2010 and has sold 30 boats to date. Riviera, Australia’s largest and most awarded pleasure boat builder had a hull of a good line up for the 2011 Auckland International Boat Show with nine boats on display ranging in size from 43 to 58 feet. The Auckland International Boat Show is New Zealand’s largest on-water boat show featuring up to 200 boats from trailerboats through to motoryachts and attracting more than 20,000 boating enthusiasts. The annual show was held from September 15-18 at Auckland’s Viaduct Harbour, home to the 2000 and 2003 America’s Cup, where boating enthusiasts will see first-hand what Riviera has to offer the discerning buyer. R Marine New Zealand will show case some of Riviera’s latest and most innovative models including the 5000 and 5800 Sport Yachts. Premium brokerage boats include the 4000, 45, 47, 48 and 51. New Zealand is home to some of the world’s best game fishing grounds and blue water cruising, which is why Riviera is such a sought after brand. R Marine New Zealand dealer principal Bruce McGill said the Auckland International Boat Show would provide a great opportunity for Riviera to introduce its latest designs to the New Zealand market. R Marine New Zealand will also have details on the display of the striking new 53 Enclosed Flybridge, which has already received 18 orders since its release in May and the new 61 Series II Enclosed Flybridge which has sold nine of these new models since its launch in May 2011. Riviera’s floating display will be at stand 13 on the water alongside the new exhibition centre. Sealine International will be returning to the South Coast with a direct retail operation which will provide a complete range of sales and after sales services for both new and existing Sealine customers. The factory-owned operation will initially be located at Saxon Wharf in Southampton, prior to moving into a state of the art showroom that will house the complete range of Sealine models from 35 to 60 feet. The new operation will provide a complete range of after sales services together with new and used boat sales. The Sealine South Coast brand will be retained by Sealine International following the expiry of the existing dealership contract between Sealine and Ancasta on 31st August this year. Roger Wakefield, who has held the position as Head of After Sales at Sealine’s headquarters in Kidderminster, will be taking up the post of General Manager for Sealine South Coast with immediate effect. Sealine launched three new models at the forthcoming PSP Southampton Boat Show – the SC42, C48 and a limited edition SC35. Leading luxury British boat builder, Sealine International, today (21st September 2011) announced that it has appointed Michigan based Rex E. Schlaybaugh as its new Chairman of the Board of Directors. The Oxford Investment Group, Inc. acquired Sealine from the Brunswick Corporation at the end of August on behalf of private investors. Mr. Schlaybaugh is Chairman and Chief Executive Officer of a national US law firm, Dykema, headquartered in Detroit with offices in Michigan, Texas, Illinois, California and North Carolina as well as numerous international affiliates worldwide. He has also acted a counsel to Oxford for more than 25 years and is Oxford’s Vice-Chairman. With more than 35 years in legal practice, Mr. Schlaybaugh has built a significant corporate law and corporate finance practice that includes a concentration in mergers and acquisitions; buyouts and recapitalizations; capital markets and lending; and corporate governance for public and private companies. Mr. Schlaybaugh is a frequent speaker on merger and acquisition matters and on corporate governance issues facing boards of directors. He also serves on the boards of several organisations and businesses including the Metropolitan Affairs Coalition, the John Hancock Life Insurance Company (USA) and the Detroit Economic Growth Corporation. Mr. Schlaybaugh has been chairman of the Michigan State Chamber of Commerce, was a member and Chairman of the Board of Trustees of Oakland University and is a member of the Dean's Advisory Board of the University of Detroit Mercy School of Law. Mr. Schlaybaugh has a B.A. in Economics from Albion College and a J.D. from the University of Detroit School of Law. Mr. Schlaybaugh is a life-long boater. Launched in May 2011, the 70 Sunreef Power DAMRAK II has spent a week in Scandinavia before heading to the Mediterranean for the Summer charter season. After her launch in Gdańsk, Poland in May 2011, the 70 Sunreef Power Damrak II has departed for her maiden voyage to Scandinavia with the owners Olivier and Katia, their 2 year old daughter Anna, and a couple of their friends, Marcus and Mia. They were accompanied by three crew members : Joc, Shaz and Stephanie. They wanted to explore the untouched beauty of Nordic landscapes before heading to the Mediterranean for the summer. Leading nautical performance and lifestyle brand, Sebago has announced a collaboration with Sunseeker to serve as their official footwear sponsor at the 2011 PSP Southampton Boat Show. The iconic American brand best known for their original hand-sewn Docksides and ‘Sunseeker’ have engaged in a partnership to celebrate their shared passion for the sea and commitment to promoting the sport and lifestyle of motor boating. Few brands can confidently claim to rank amongst the world’s finest. To own a Sunseeker is to buy into a style and to make a lifestyle statement. When only the best will do in luxury and performance, Sunseeker sought a partner with synergies in their ethos. For over six decades Sebago has been igniting individuality in all product ranges inspired by their roots in the Magical states of New England, USA. All lines are ideal for life in or around the water, made for who people are and how they live. The 65 year old brand is steeped in history and is one of the most respected footwear brands in the world, so the partnership for this year’s Southampton Boat Show is both complementary and exciting. Both brands believe in the power of innovation, in the tireless pursuit of excellence. The involvement with Sunseeker sets in motion Sebago’s intention for the brand across the UK and Europe to showcase their strong performance credentials in motor boating, sailing and other multi-water sports. The sponsorship follows on from Sebago’s recent launch of the ‘Triwater’ range which incorporates Blue Water technology providing the most durable and technologically advanced performance marine footwear on the market today for sailing and boating enthusiasts. The new range is tipped to be the “toughest shoe on the water.’Sebago has partnered with one of the best known and most highly respected brands in the superyacht industry. At this year’s PSP Southampton boat show, Sunseeker have 18 motoryachts on display and one can peruse Sunseeker’s grandest creation, the ‘Predator’ 130’ which is the largest and most expensive boat at the show. Sunseeker International has joined the growing social media community, the 21st century has created an online world that allow us "tweet", "like" and "poke" each other. It has created an interactive platform that connects us in real time, allowing us to spread the word and share our thoughts to other likeminded individuals around the world. Sign up to the official Sunseeker International page on Facebook, or follow us on Twitter. Like us or tweet us to keep up to date with all the Sunseeker breaking news and events. Regular updates will come to you as "tweets" or "wall posts" from the people in the know. As part of our efforts to bring news from the Sunseeker World Headquarters to as many people as possible. This year's Southampton Boat Show saw the launch of the new Manhattan 53 at the 43rd Southampton Boat Show September 2011. The stand was as impressive as ever and continued to exhibit innovation and true craftsmanship across a range of Sunseeker craft. The preview day saw a show stopping performance from the talented Ronan Parke, recent runner up on the televised Britain's Got Talent show, to mark the launch of the stunning new Manhattan 53 and the new luxurious Sunseeker interior range, incorporation with Armani Casa. Eddie Jordon joined Founder Robert Braithwaite for the official launch and the cutting the ribbon. Tecnomar are pleased to inform you that after intensive negotiations over the last two months, finalizing the following sales: New build MY Impero 45-metre in steel & aluminum with delivery scheduled in 2013; New build MY Impero 40-metre in aluminum with delivery scheduled in 2013; New build MY Regale 33-metre in aluminum with delivery scheduled in 2013. It has been a busy period for Tecnomar as the first Sailing Yacht Silent 76-foot has also been sold recently with delivery scheduled in summer 2012. Tiara Yachts was recognized by the National Marine Manufacturers Association for excellence in customer satisfaction. This prestigious award is presented to manufacturers who recognize the importance of customer satisfaction programs and utilize industry best practices. Tiara Yachts has prided itself for many years on its commitment to excellence both in the quality of the product they build, and the service they provide to their loyal customers. Tiara Yachts has been honored for their efforts to increase customer satisfaction levels in the boating industry. In order to receive this award, Tiara maintained a standard of excellence of 90 percent or higher in customer satisfaction over the past year. Tiara Yachts surveys every new boat owner in an effort to receive feedback on how they can improve. This diligent research process allows Tiara owners to feel confident that Tiara will go above and beyond to make sure the owner’s boating experience is enjoyable. Tiara Yachts knows how valuable the customers are to the company, and are pleased to be presented with this award for their efforts.